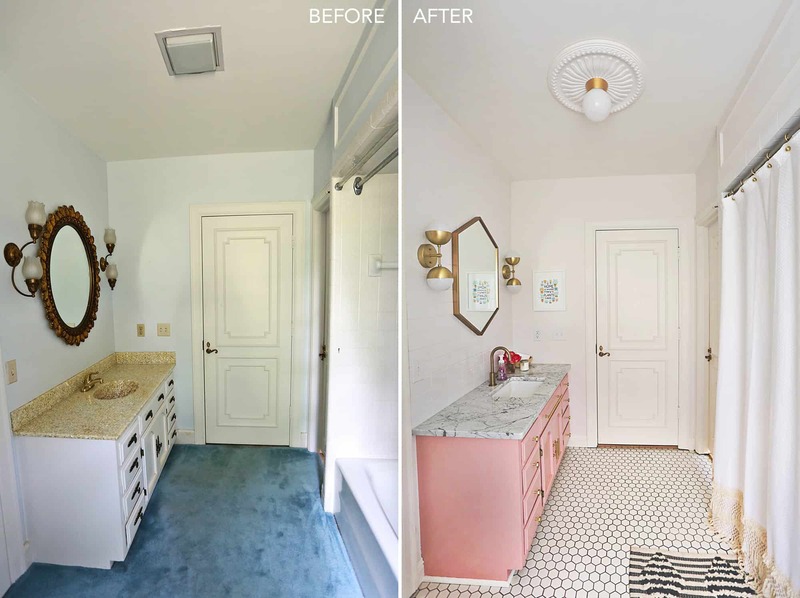 Today I am here to share a before/after tour of our guest bathroom. This room has evolved quite a bit over the past year. It was one of those rooms that slowly decorated itself—or at least it felt that way. I tried lots of things that just did not feel right in this space to get to the point where it is today. This is our guest bathroom. It is a jack and jill bathroom, shared by our two guest bedrooms. I have shared some peeks of our guest bedroom here and the kiddos guest bedroom tour is here. When we found this house, it happened to have one more room than what we were looking for, so we decided to put it to good use as a double guest room. 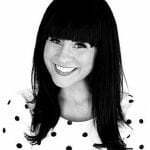 We have guests very often (usually more than once a month), and it’s been really useful with our growing family and friends with growing families. Anyway! This bathroom is also the one that is closest to our living areas, so it gets used the most often and is the most “seen” by all of our visitors. Before I share the tour, let’s get refreshed on how it looked before. This room was a bit depressing in the beginning because it had a rotten subfloor that showed up in our home inspection, but then cost far more than was projected. Fun times! You can see a close up of the counter top material here. It was kind of cool and vintage, but sadly it was damaged beyond repair. To keep costs down a bit, we decided to reuse the existing vanity and just update it with paint, new hardware and a new counter. Originally we painted the white vanity black, and it looked nice, but it just did not fit with the rest of our home and it always bugged me. I have loved using black and high contrast in a lot of my previous homes, but in this home we have stayed very low contrast and I love the feel of it! It just really fits. I felt that painting it back to white would be a little too safe, and since the room didn’t really have a statement piece yet, we decided to go pink. 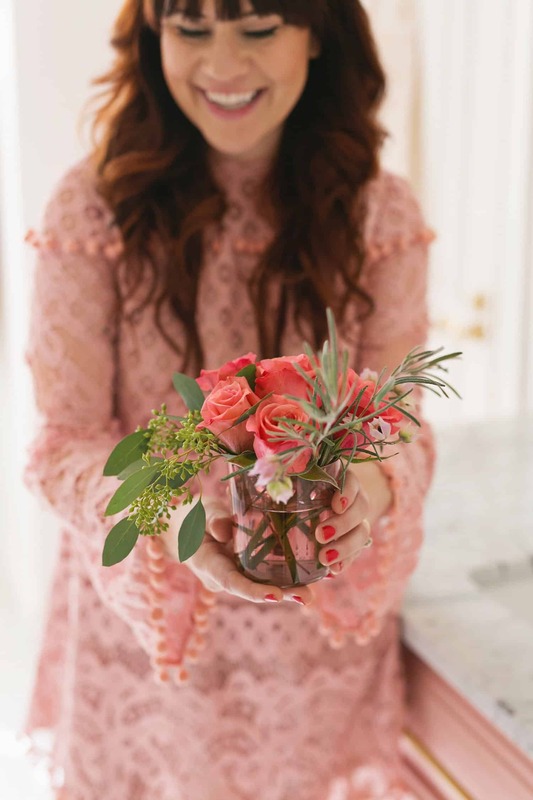 I fully realize that pink in home decor isn’t for everyone, but gosh—I really love it! And I also like that it’s an easy weekend project to re-paint if (when) I eventually get tired of it. We used Quartz Blush by Sherwin Williams. The hardware is a combination of Schoolhouse Electric Hex Knobs and my typical go-to Lewis Dolin round bar pulls that are mostly used throughout our home. The mirror was tricky. It had to be a certain shape and I wanted something unique. This one from West Elm was sold out for a long time, so as soon as it came back, I ordered it right away. Our sconces are from Lucent Lightshop. They are my favorite thing in the room. I think they were the first thing I chose for the space, and I basically decorated around them as my muses! Our faucets are from Delta. I used them in a couple bathrooms and on Jeremy’s coffee bar in his studio (but in black). I tried so hard to find really inexpensive brass hardware at first and later had to replace a couple things with these because they leaked from day one… ugh! I highly recommend these. We have the kitchen version in our kitchen as well. I have shared that I do have some regrets choosing real marble for the bathrooms. That said, I am really glad we chose a more contrasty pattern because the small stains and marks that are unavoidable over time aren’t really noticeable. We chose a super simple stack bond subway tile backsplash to the ceiling. The art print was a gift from Kelly and Jeff. I love it! Here’s another view. I added the little brass horseshoe (just a vintage find from eBay) to the door as a towel hook. I used the same one in Kacey’s living room. I’m glad we chose this really simple hex tile. It’s really light and pretty and easy to clean. We save sample size toiletries from cool hotels for our guests. I think it’s nice to try to think of all the little things that make traveling really annoying (or embarrassing). In the drawers there are extra toothbrushes, razors, face wipes and all the other things I’ve ever forgotten when traveling. 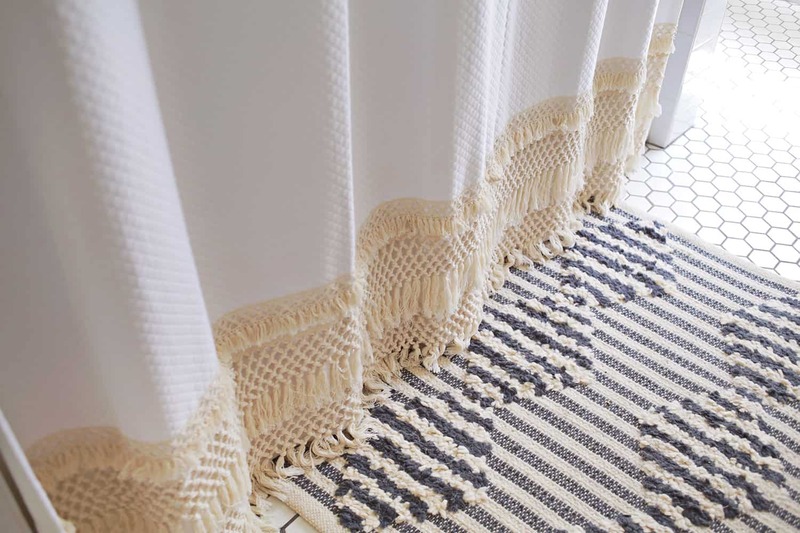 We are still enjoying our DIY macrame shower curtain. You know how certain views make you happy every time you see them? This is one for me! I finally added a plant to this space and it’s thriving. 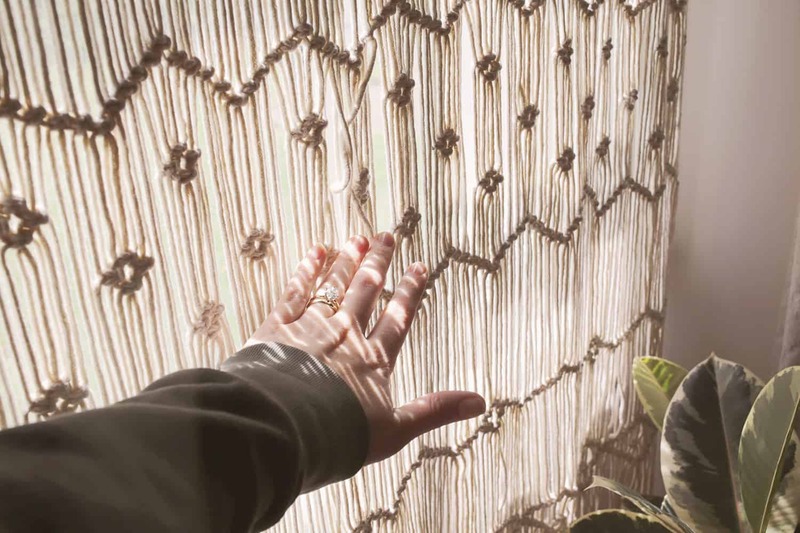 I just have to remember to open the roll up shades behind the macrame. 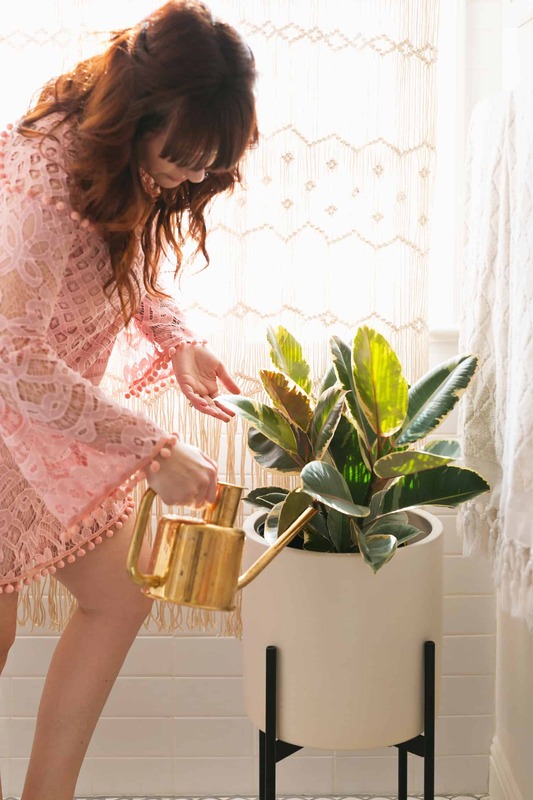 This planter from Modernica is my favorite. I waited for a while to find a rubber fig plant with this coloring. It’s one of my favorite plants! This poster from Fine Life Co. was one of the first things I purchased for our new home when we still lived in Missouri. I love it and it fits the space perfectly. The brass towel bar is from Rejuvenation. Here’s the opposite view. It’s pretty simple. We continued the stack bond tile from the shower around the toilet area. We kept the existing storage shelves that came with the house and we added a little Ikea shelf above the toilet for a few extra toiletries. I sometimes put a few flowers there when we have guests. Finding the right curtains for this space was challenging. We tried our go-to curtains from the rest of the house, but they seemed too bulky for this tight little nook. We ended up using this hanging macrame (similar here) as a curtain. I like the seventies feel it adds to the room. Let’s talk about lighting for a sec. 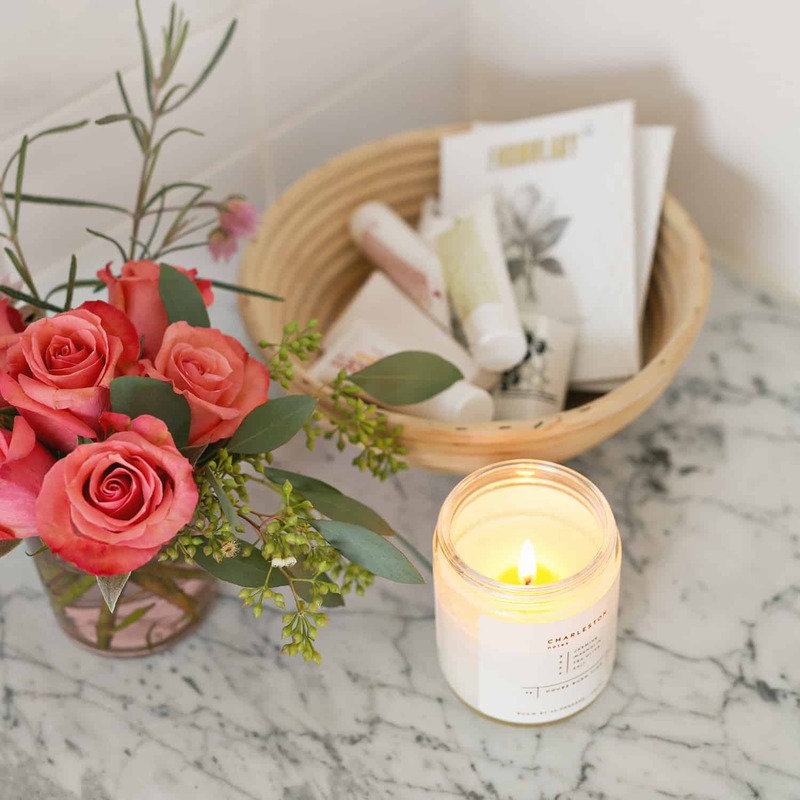 I totally believe lighting is a worthy splurge for most spaces, but I also like to incorporate budget-friendly solutions so it’s not all splurges! You can see the before/after here in the photo below. The before light fixture was just a simple box light with peeling ceiling paint all around it (these were ALL throughout our home in every bedroom, bathroom and hallway). 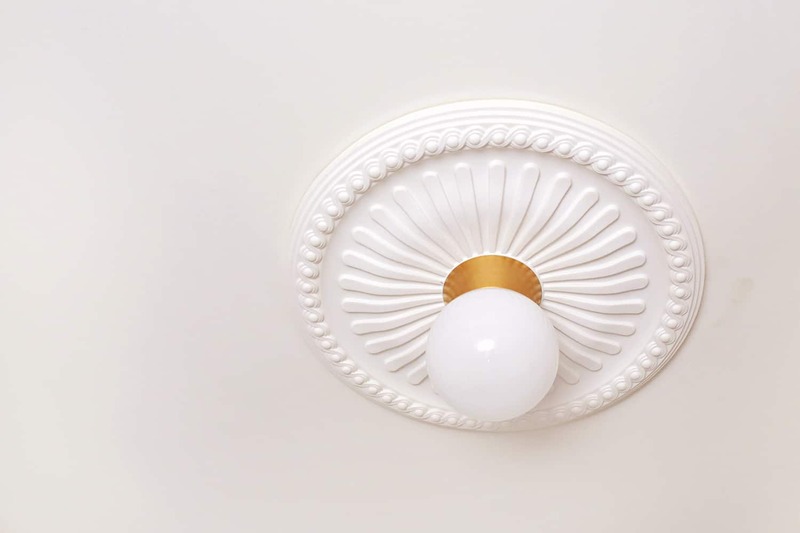 To replace it with a cool mid-century flush mount would be at least a couple hundred dollars, plus the cost of a ceiling medallion or patching the square hole. It starts to get pricey when you do these all throughout the home, so I’ve found that mixing them with budget options helps to cut costs. Plus, since I already had the amazing sconces as a focal point in the room, it didn’t really need another chandelier. So we opted for this super simple solution, and it was under $50! I found this ceiling medallion on Amazon (they have more unique options than the big box stores) and then a $7 LED light. These are awesome because you never have to replace the bulb and they are energy efficient. It originally had a white base, so we spray painted it gold. Super easy! Thanks so much for reading! Decorating this home has been the biggest joy to me!! It has truly been one of the best years in my life (well almost two years now, can you believe it? ), and instead of immediately getting the itch to move, I’ve been feeling more settled, more attached and more in love with this home every season. 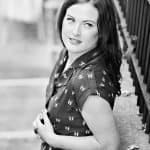 Credits//Author: Elsie Larson, Photography: Amber Ulmer and Elsie Larson. Project Assistant: Collin DuPree. Photos edited with A Beautiful Mess actions. I love the colour scheme of the new bathroom! It’s so you, Elsie! This space turned out so well! I really love the flooring and curtains that you used it brings a unique flair to the space! Beautiful! 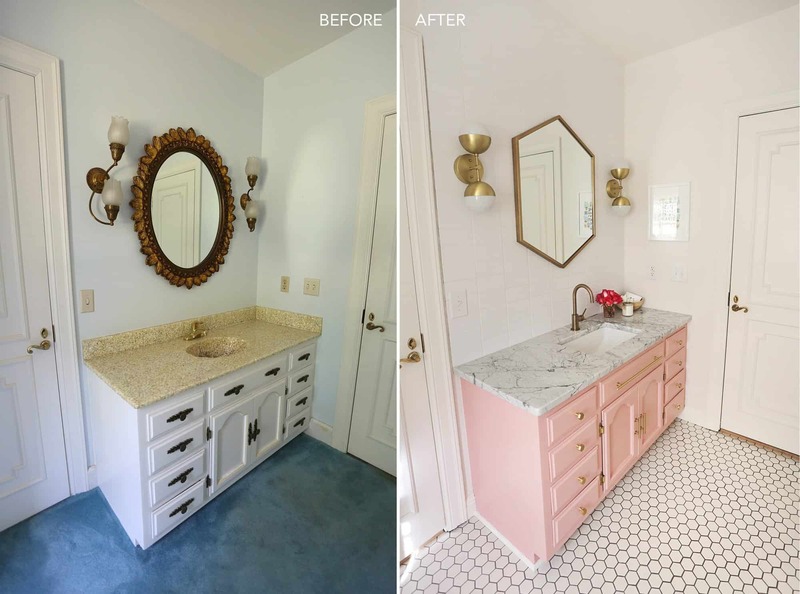 What caused you to paint the very bottom trim around the vanity white rather than pink? I feel like pink would blend in better so I didn’t know if there was some kind of trim rule, but seeing that you don’t have base shoe trim anywhere else I feel like the white there just sticks out. It’s from Target, I believe. I’ve been thinking of painting my kitchen walls pink. I think you’ve just inspired me to go ahead and do it. LOVE this!!!! Yep! You only live once and you can always change paint colors if you change your mind! Do it! Paint is such a simple fix. I always get annoyed when I watch HGTV and people get panicked about paint colors because that’s usually one of the easiest fixes. I won’t deny that it can be time consuming and can get pricey sometimes, but it’s better than having to gut a kitchen or bathroom, or redo the electrical. It looks so much better now! And I absolutely love the pink statement piece! It gives a whole new feel to the room, a much more fun and bright and positive vibe. LOVE the idea of a ceiling medallion and light. Where did you purchase your light fixture or do you have any recommendations? Thanks so much! Just made a mental note of “quart blush”. That pink is absolutely perfect. Somehow it manages to be bright but also subdued! Beautiful, as always. Would love to see how it looked in black, too. That would give the space a whole different vibe. Sherwin-Williams doesn’t have a record of Quartz Blush. Can you advise the actual color to order? Do you still have the paint can? Or, the lid? Sorry, I wrote before I finished research. You can still get this color from SW. You have to ask for it as part of the HGTV-HOME colors. What a transformation! It looks marvelous! Love the tile floor and the pink!!!! I love that planter! It would be perfect for my living room. Do you happen to remember what size it was on Modernica? I absolutely love this bathroom!! 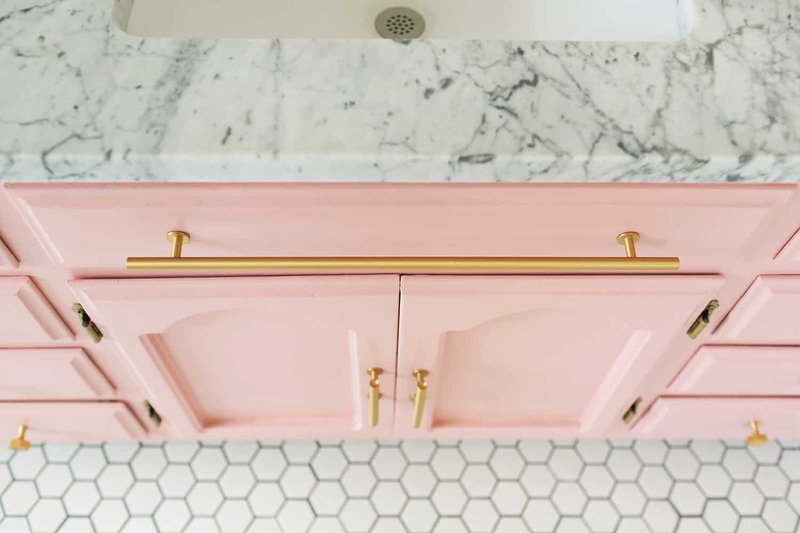 I’m obsessed with pink and also the white marble looks perfect on top ? I love following along as you show pictures of your home Elsie! also off topic, but I was shopping this weekend and saw a blush pink short dress with long bell sleeves, a bit out of my comfort zone but seeing your outfit posts here of similar dresses made it seem like fun to try on so I went ahead and had a fun dress up time, even though the dress didn’t end up working for me XD thanks for inspiring me to try something new! LOVE how this turned out, lady! It’s so wonderfully cheerful! It looks so wonderful, I love the brass details and the tiles! Wow, well done Elsie! Looks like a lot of effort went into this, but it looks so effortlessly chic. Love the baby pink and gold hues. Thanks for sharing! 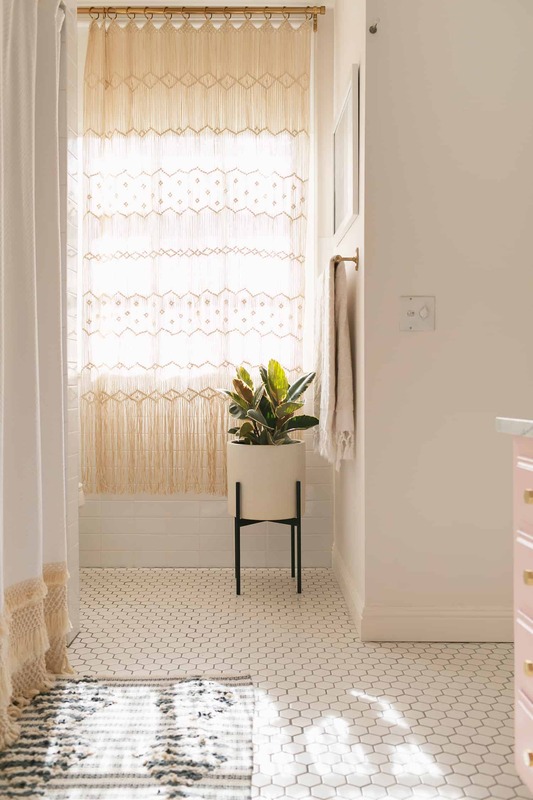 Love the Macrame curtain! Such a light and lovely space! Also I must tell you that I thought your “Home Is Where My Plants Are” sign definitely said PANTS at first. Haha! 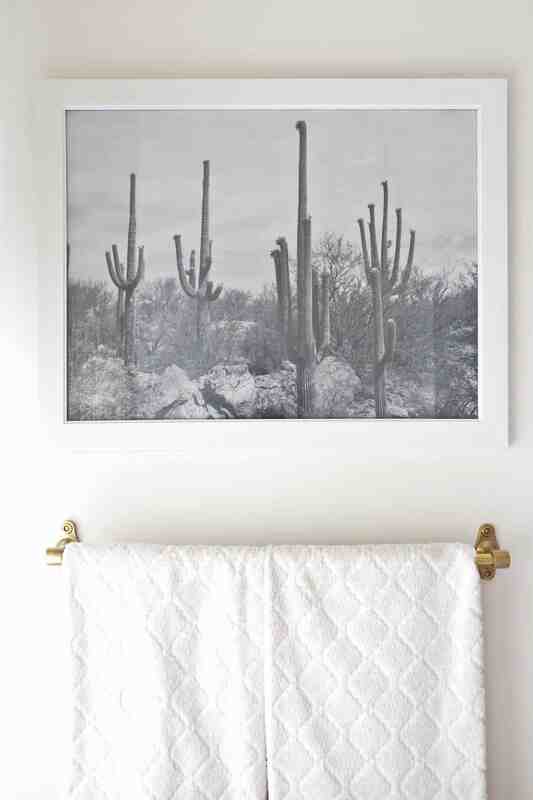 I’m obsessed with this bathroom not only because I’m a part of it (print looks beautiful!) But the design is SO dreamy! Keep up the amazing work, Elsie! PS I feel so special that when you guests sit on the loo- they’ll think of me! Hi Elsie, your home is such a personal, unique yet trendy space. I was wondering where your gorgeous dress is from- I really love the colour, delicate lace, pom-pom trim, basically everything about it. Have a wonderful spring. All the best with the adoption anticipation. I can only imagine what a bright and beautiful environment a little girl will be welcomed into. I could just stay in that room. No actual bedroom needed. Just give me some fluffy pillows and I’ll curl up in the tub. OMG Where is that dress from????? Hi Elsie! Love this! Question for you- looks like your tile changes to wood outside of the bathroom. What did you use to transition between the two floor types? I’ve been researching some brass options but haven’t found anything I like. Thanks! Boy you make GOOD use of your spaces. Another awesome room tour! I know you have replaced the counters here, but have you ever used the sticky back vinyl for covering counter surfaces? Our kitchen is in dire need of a refit, but it’s not in the reno budget currently and so we are looking for new ways to freshen it up and make it more appealing. We were considering the vinyl covers for the worktops to give it a face lift. You have created such a beautiful space, well done!! 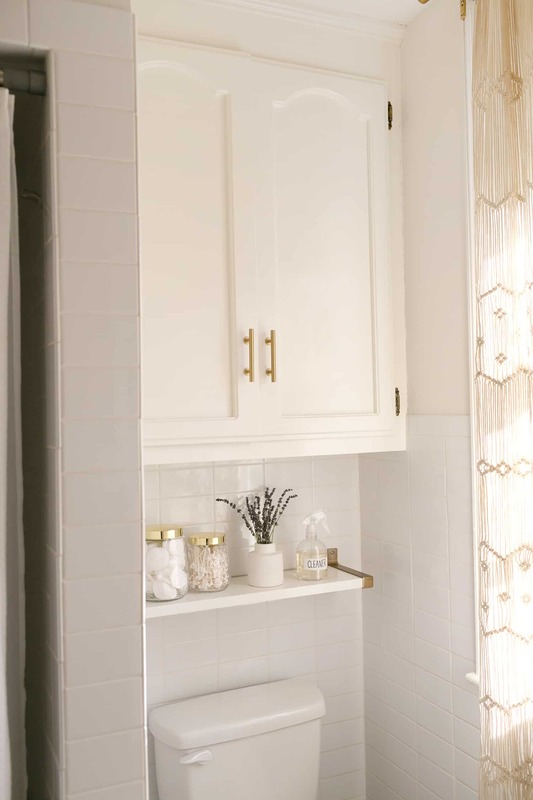 I love both the general feeling and all details in this bathroom, it is absolutely gorgeous!!! I would also love to know where you got the ceiling light from! 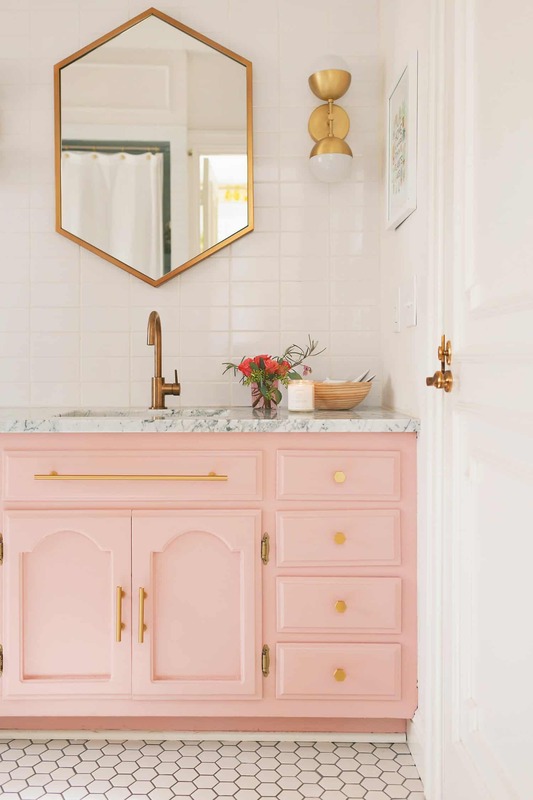 Love, love, love the pink vanity cabinet. If I could, I would paint everything in my place a baby pink because I have always been obsessed with that color. (I hesitate because I will sell this home in a couple of years and need to keep it more buyer-friendly rather than taste specific.) So few people want pastels. Someday, I’d like to have all pale pink kitchen appliances (vintage style). For now, I have to settle for my pale pink Kitchen-Aide stand mixer which is absolutely adorbs! This transformation turned out amazing! I love the Quartz Blush color, it makes everything so calming and happy. And all of the gold hardware is perfection! LOVE how this turned out. The hanging macrame is such a cool idea. Can you tell me the style/brand of the floor tile you used? This is a great remodel. And it resembles our bathroom very much, so it gave me good ideas! Thanks! What a stunning transformation! 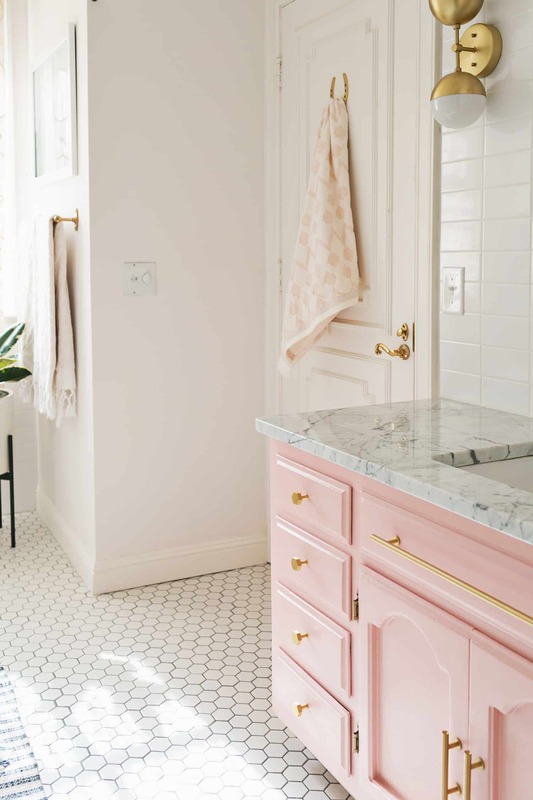 I love the pink vanity with the marble top…just gorgeous! And what a difference all the hardware and lighting made. I love it! I’m trying to locate Quartz Blush at Sherwin Williams, but I can’t find it on their website? I see Quartz White was it some special formula? Hi Katie! It look like it was only available for a limited time. I’m sorry! I love it! Pink and touch of gray and lots of brass! May I ask what’s the process you did in changing the vanitys color from black to pink? Thank you! Your dress is sooooo pretty too!!! Thank you SO much Kristin!!! Hi Elsie! Love the ceiling medallions so much that I’m looking to recreate it! If you dont mind me asking what is the diameter of the ones you used? 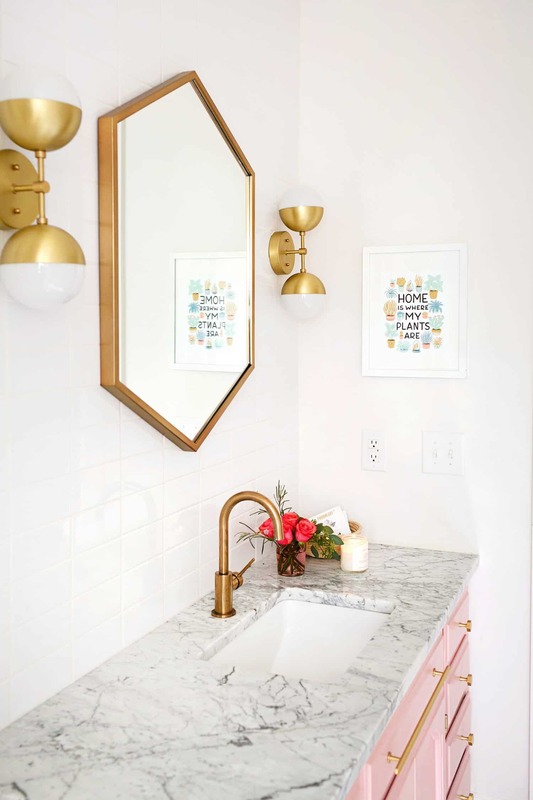 Anyone execute the pink vanity in a similar color? I’d love to you know what you used! I would have never thought about painting the vanity pink, but it totally works! So fun. And I love the “curtain” on the window. So pretty! Just came across this link while looking at faucets on another site.